A wooden honour roll commemorates those who served in World War One. It lists 38 names. During the currency of the war Bangor has steadily responded to the call for recruits, and few eligibles remain. It was thought fitting that some mark of recognition should be placed on record. 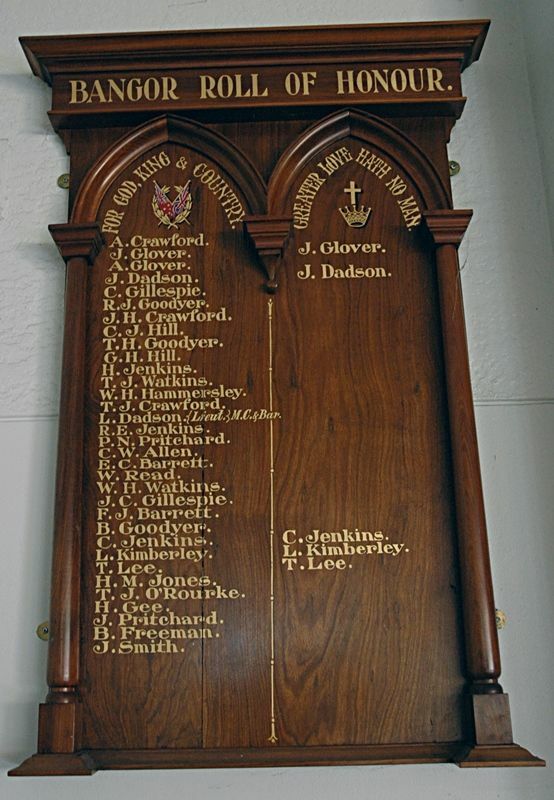 A committee formed for the purpose decided to place a roll of honour in the church. The unveiling took place on Sunday evening, the Rev. W. Greenward (rector for the parish) performing the ceremony in the presence of a large congregation. The roll, which contains 33 names, four of whom have made the supreme sacrifice, is made or polished blackwood. Above the names are the Union Jack and Australian flag, then a crown and cross above the names in transcript of those fallen. The lettering is in gold. Examiner (Launceston), 21 December 1917. The building where the honour roll is a de-consecrated church and is now a private residence.